Salt has hygroscopic properties, which means that it draws water from the surrounding atmosphere. 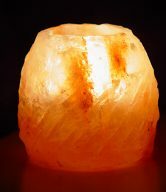 Salt Crystal Lamps should therefore never be sprinkled with water, kept in a moist room or be placed outdoors. 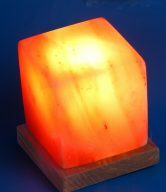 Sometimes, in particularly moist or humid conditions, the lamp surface may be slightly damp to the touch. Lighting it for a few hours dries it very quickly. If crystallization occurs, just wiping with a damp cloth will get rid of it. For most everyday situations, this is not a concern. 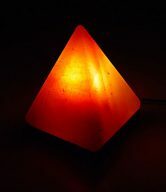 It is recommended that you light your lamp every day for the best air purifying results, and you can leave your lamps on for as long as possible. This will not only maintain a constant negative ionizing process, but also repel excess moisture build up around the lamp. 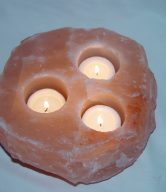 Wipe the lamp with a damp (not soaking wet) towel or sponge in order to remove dust. Once cleaned, dry the lamp with a paper towel or turn on the lamp for a while.